The magic of Christmas is set to sweep across Chester city centre as CH1ChesterBID’s popular ‘Chester Kidsmas’ festival returns for 2015. Created exclusively for Chester by CH1ChesterBID Company, the childhood magic of Chester Kidsmas begins with the Christmas lights switch-on and a brand new ‘Twelve Days of Christmas’ themed parade on Thursday 19 November, coinciding with the start of late night shopping in the city every Thursday until Christmas. An enchanted Santa’s Post Office, festive movie screenings and special holographic glasses that turn decorative lights into sparkling Christmas shapes are just a few of the other free activities heading to Chester as part of a packed programme of family-friendly fun. “Christmas is an incredibly magical time of year and with Chester Kidsmas, we’ve made a significant investment in ensuring that there is something special for everyone visiting Chester this Christmas,” said Rita Waters, Chief Executive of CH1ChesterBID. A unique addition this year is an enchanting Santa’s Post Office on Northgate Street, which will be open from Saturday 21 November and every weekend until Christmas, in addition to 21-24 December. Unlike anything Chester has ever seen before, the festive experience gives children the chance to write their Christmas wish list with help from Santa’s elves and then post it in a special letterbox before watching in wonderment as it flies all the way to Lapland. ‘chELFie’ – CH1ChesterBID’s very own Christmas elf ­– will make a welcome return to the city alongside his new female friend ‘ELFie’. 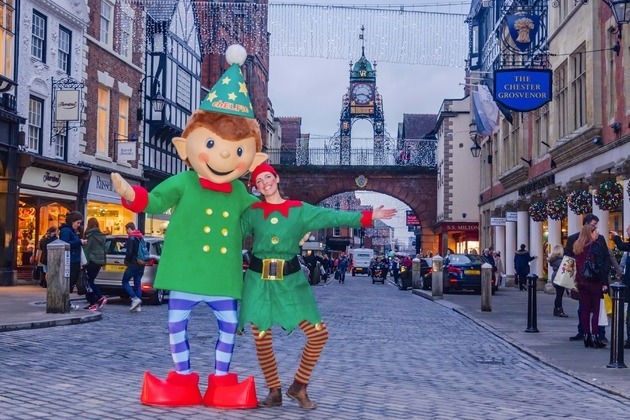 The duo will lead the Christmas Parade on 19 November and will be out and about in the city centre every weekend until Christmas, handing out free holographic glasses that transform Chester’s Christmas lights into images of candy-canes, snowflakes, reindeer, snowmen and even Father Christmas himself! Christmas will also be on the big screen with family favourite movies including Home Alone and Elf being shown at the Grosvenor Museum. The free screenings will give families the perfect opportunity to enjoy a festive cinematic atmosphere, starting from late November and continuing throughout December. The Christmas dressing of the city centre has also been enhanced this year after CH1ChesterBID and Cheshire West and Chester Council teamed up to provide more Christmas decorations, new and improved lighting and additional Christmas trees in the city centre. For more information about all the events and activities taking place this Christmas, people can visit www.christmasinchester.com or follow #chesterkidsmas or @chELFie_CH1 on Twitter.